Posted on 12, May 2016 by EuropaWire PR Editors | This entry was posted in Art & Culture, Education, Science, United Kingdom and tagged Alice Sartori, Free arts, Gateway Galleries, Joanne Orr, Kit Martin, science activities, St Andrews. Bookmark the permalink. Fife, Scotland, 12-May-2016 — /EuropaWire/ — An afternoon of free arts and science activities, led by Fife-based photographer Kit Martin and University of St Andrews students, will take place at the Gateway Galleries in St Andrews as part of the nationwide Festival of Museums on Sunday 15 May from 12 noon to 4pm. Exploring the idea of flight, Let’s Take Flight will give visitors the chance to “fly” over St Andrews, experiencing the sensation of swooping over rooftops thanks to 360° video of the town that has been filmed by drones and will be projected through immersive, virtual reality headsets. Kit Martin will lead a series of art sessions, enabling event-goers to create their very own cyanotype to take home. Also known as a blueprint, a cyanotype is a form of photography that emerged in the 19thcentury. It is created by mixing potassium ferricyanide and ferric ammonium citrate. When exposed to ultraviolet light, the chemicals react to reveal an image in a striking Prussian blue colour. The cyanotype sessions will run hourly from 12 noon until 4pm (the last session will begin at 3pm). The drop-in sessions are open to all ages, on a first come, first served basis. The family-friendly event is part of the exhibitionSkyward: a Study in Flight which is on display in the Gateway Galleries until 15 May. Skyward has been curated by postgraduate students from the University of St Andrews Museum & Gallery Studies Masters degree and tells the story of University Professor James Bell Pettigrew’s quest to build a flying machine in St Andrews over a century ago. 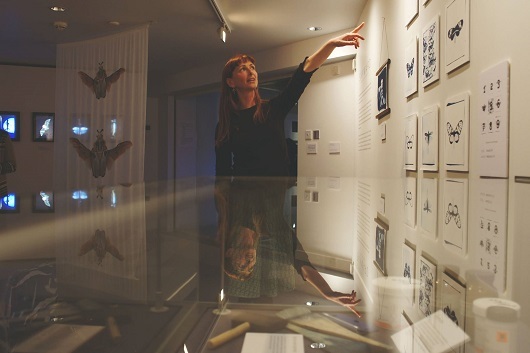 The exhibition also features winged specimens from the University’s natural history collections alongside a series of cyanotypes and photographs by Kit Martin. The Festival of Museums is an annual event coordinated by Museums Galleries Scotland to showcase Scotland’s extensive cultural offering with a series of events across the country from Friday 13 to Sunday 15 May. Let’s Take Flight will take place on Sunday 15 May, from 12 noon to 4pm, at the Gateway Galleries, North Haugh, St Andrews KY16 9RJ. For further information telephone 01334 461660, email: museumlearning@st-andrews.ac.uk or visit Skyward. Admission is free. Press photographers are welcome to attend from 12pm. Created and coordinated by Museums Galleries Scotland (MGS), Festival of Museums encourages Scotland’s museums to provide visitors with the opportunity to enjoy exciting, entertaining and surprising day or night events at museums and galleries over one weekend. This year’s Festival will take place from Friday 13 May to Sunday 15 May and features a range of over 100 events, taking place at cultural attractions throughout Scotland. MGS works in partnership with Culture 24/Museums at Night which takes place over the same weekend. In 2016 MGS is also working with Voluntary Arts Scotland to tie into Voluntary Arts Week and develop partnerships between museums and voluntary arts groups across the art forms. Kit Martin is based in North Fife. Her background is in medical and forensic photography. Interested in detail, texture and fragility, Kit photographs nature, either dead or alive, and people. Kit makes cyanotype prints from both objects and digital negatives, and has also recently been experimenting with photo etching and the Wet Plate Collodion process. For Skyward: a Study in Flight, Kit has turned a contemporary lens on winged-specimens from the zoological collections of the University of St Andrews’ Bell Pettigrew Museum. Kit Martin’s images acknowledge the scientific use of these specimens while highlighting the inherent beauty of the natural world. The striking blue of cyanotype prints in combination with other photographic and printing techniques transport visitors on a journey ‘skyward’.